Kobe Bryant could miss the season opener - for openers. 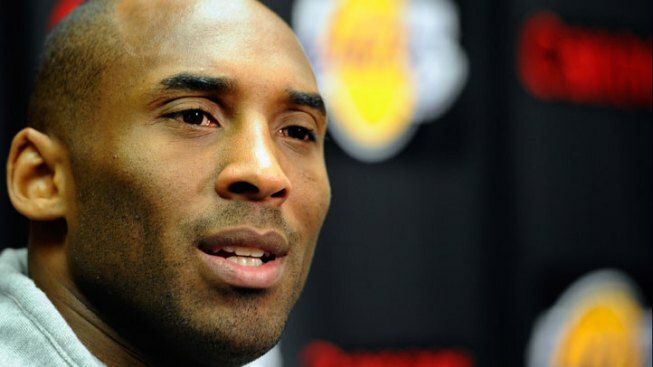 Lakers star Kobe Bryant could miss the team's opener Sunday and possibly more after suffering torn ligaments in his wrist. The guard suffered the injury in Monday's 114-95 preseason loss to the crosstown rival Clippers when his shot was blocked by DeAndre Jordan. Bryant is notorious for playing with injuries that would keep most players out, but the team is being coy about specific details about his latest ailment. Bryant wouldn't discuss it, either. "He plays through injuries that most people don't," said teammate Luke Walton said. "I did see his wrist and it looked like Professor Klump because it was so swollen. But I think he'll be ready by Sunday." The team opens Sunday at home against the Chicago Bulls in a nationally-televised matchup. The injury is to the lunotriquetral ligament of his right, or shooting, hand. The ligament helps stabilize two small bones on the outside of the wrist. Medical experts couldn't give a precise playing time prognosis for Bryant. "You usually don't have to operate on them, but it means that you need to let them rest so you can heal," Dr. Robert Klapper told ESPN. "Without being privy to the MRI, these types of injuries can take anywhere from several days to several weeks to heal completely," Keith Feder, a Manhattan Beach sports-medicine specialist, told the LA Times. "But depending on the pain level, and with support, the athlete could play." Even if he does play, there is some risk that the injury will affect his ability to shoot, according to Dr. Michael Hausman, professor of Orthopedic Surgery and Vice-Chairman of the Department of Orthopaedics at Mount Sinai School of Medicine. "If the damage (to the ligament) is severe enough, they can begin to shift out of the normal position and that can affect the normal mechanics and function of the wrist, causing pain and weakness," Hausman told USA Today. The on-court drama only adds to the 33-year-old's turbulent pre-season. His wife Vanessa, who Bryant met in 1999 when he was 21 and she was 17, filed for divorce last week, citing irreconcilable differences.